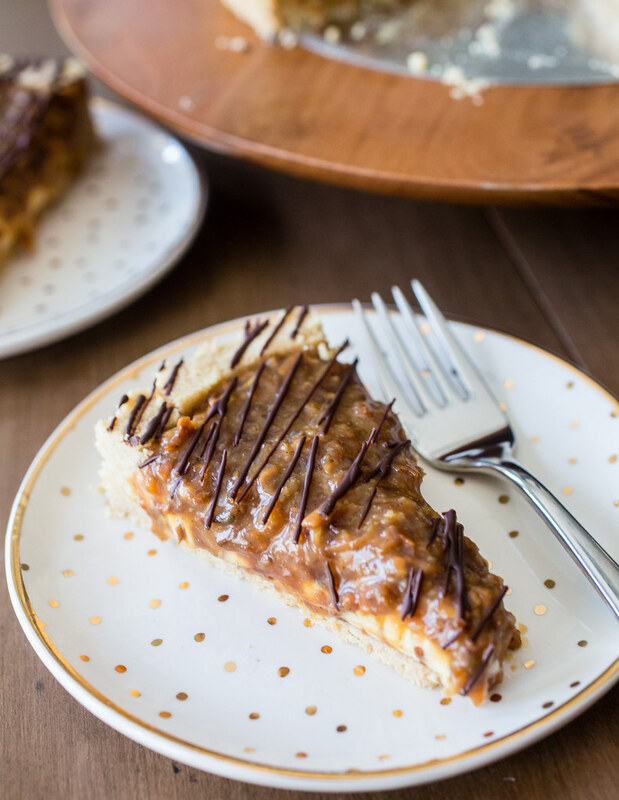 If you love Samoas Girl Scout cookies or anything with shortbread, caramel, and coconut, you will LOVE this super easy Samoas no bake cheesecake tart! So, it’s Girl Scout cookie season again in these parts! Yippee! I love the memories cookie season brings back for me from all the years I hawked boxes to my family, neighbors, teachers, etc. Except that my mom used to make me wear my uniform when I went around the neighborhood. Not the fun part. But what I still love most about cookie season are the cookies. Yes, I’ll fully admit that I love love loooove all kinds of Girl Scout cookies. My problem nowadays is that I can’t seem to find them. I don’t see the order sheets hanging around the office kitchen anymore, I don’t have Girl Scouts knocking on my door, and I can’t seem to find the right time when they’ve set up shop outside the grocery store either. Sure, I can accidentally run in an old and very good, yet former, friend who stopped returning my phone calls 7 years ago and who, as I was very surprised to find out, recently moved to my little town in the middle of almost nowhere in the grocery store at an ungodly hour of a Sunday morning (pre-8am). But yet, I can’t find Girl Scout cookies. Insert the “I’m dying inside” emoji here. Also, when do I get to use the unicorn emoji? That Sunday morning was not the time for it. Another story for another day though. Annnd I’m done with that topic. 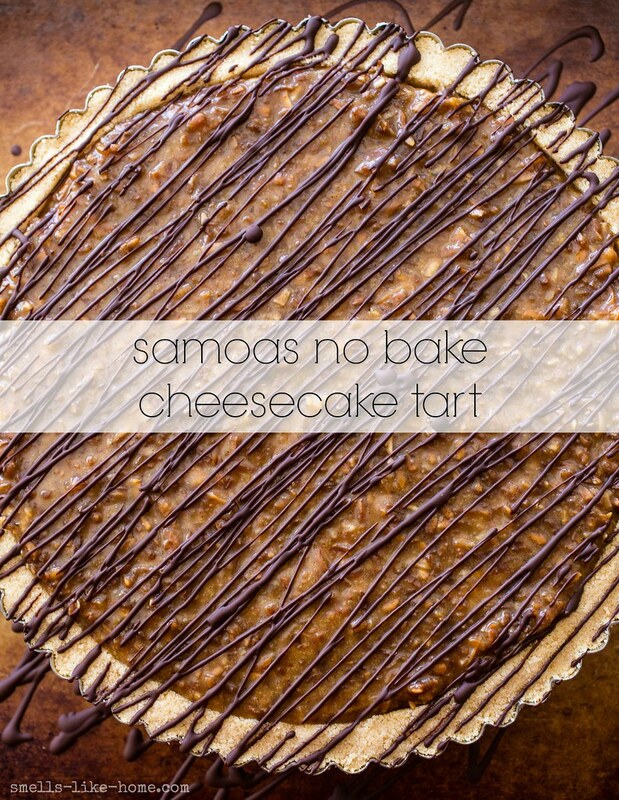 This Samoas no bake cheesecake tart tho. It’s the answer to my prayers. 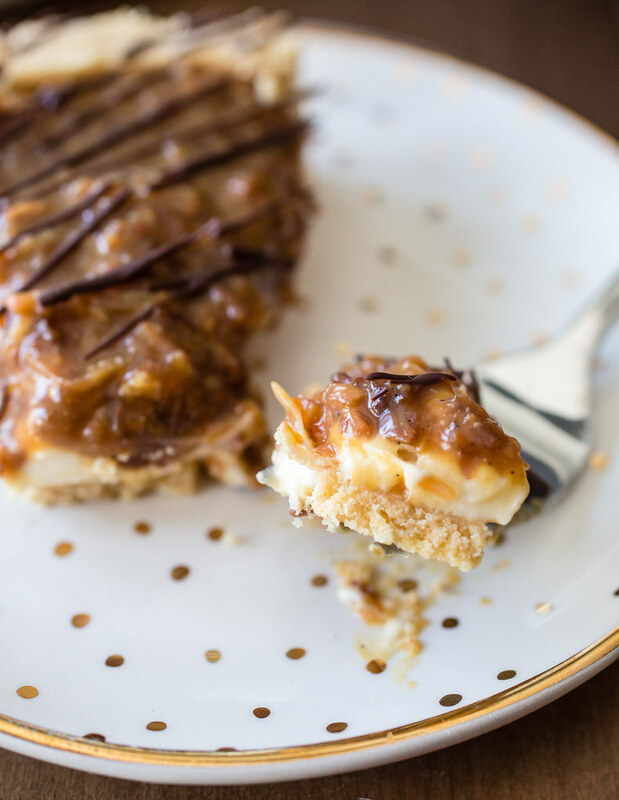 Shortbread crust, no bake caramel cheesecake filling, caramel-toasted coconut topping, and a drizzle of chocolate. You know, for good measure. It’s basically a giant Samoas cookie with a creamy cheesecake center, a stroke of brilliance, I might add, that wouldn’t kill the GS to consider. Because how else would one want to eat a Samoas tart? Plus? This version is definitely shareable. And waaay easier to make than the individual – while still delicious – cookies I made a few years back. Tarts are like that though, aren’t they? Do yourself a favor and make this tart in stages. Shortbread crust first. Then make the cheesecake filling, fill the crust, and chill it. Then the caramel sauce (if you’re making your own – it will need a couple hours to cool down) and toasted coconut. 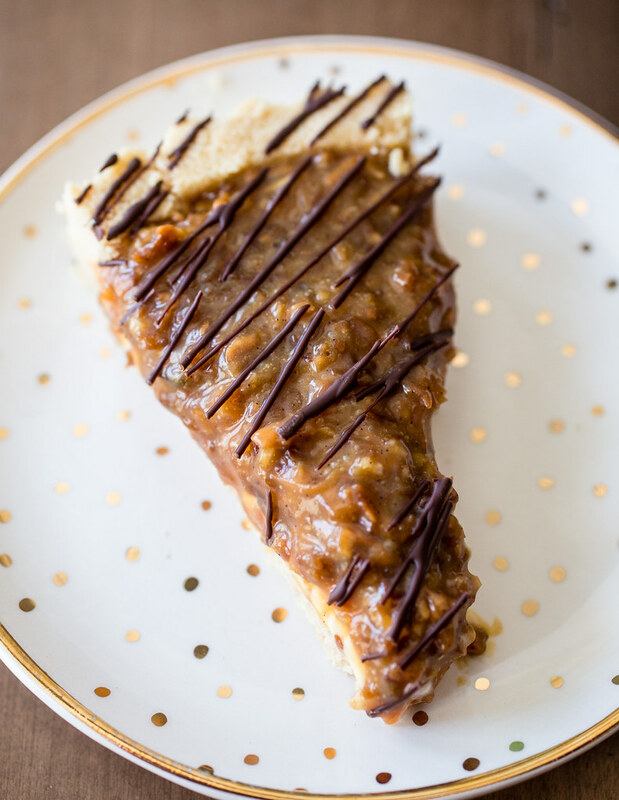 Or, you could make the caramel sauce up to 2 weeks in advance and keep it in the fridge to save some time when you make the tart. 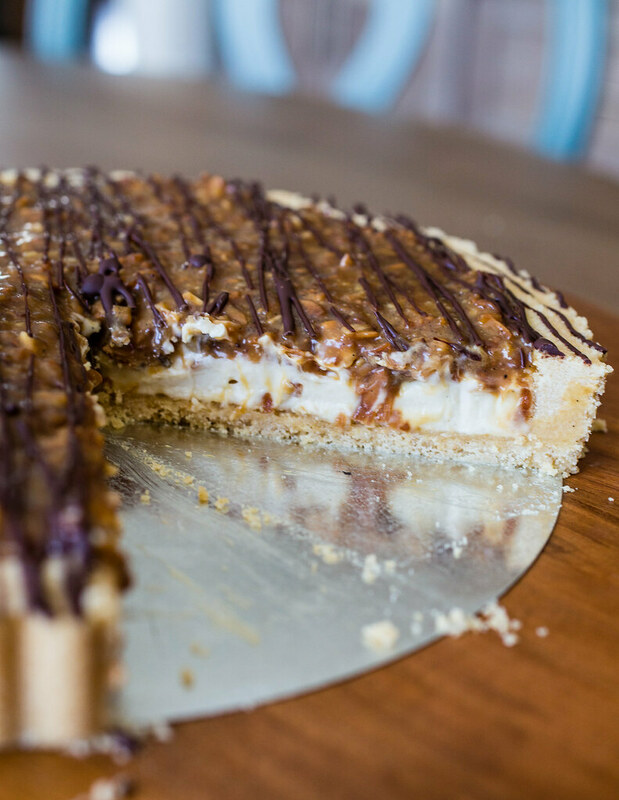 Allow at least 8 hours to make and allow this tart to chill properly before serving. And it’s just as great on the second day too so you can also make it a full day in advance. To make the shortbread crust: Preheat oven to 350° F. Ready a 9-inch tart pan on a large baking sheet. Process the cookies, sugar, and salt in a food processor fitted with the steel blade until fine crumbs form. Pour the butter over the crumbs and process until the crumbs start to come together – you may have the scrape down the sides of the bowl once or twice. When the crumbs hold together when lightly squeezed, dump them into the tart pan. 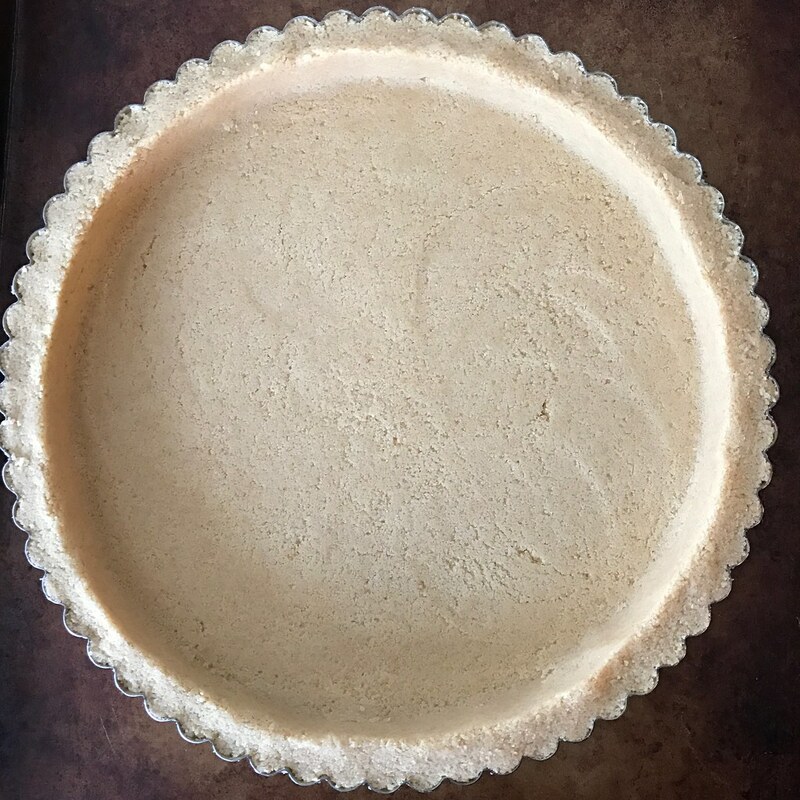 Using the flat bottom of a 1-cup measuring cup, press the dough evenly up against the sides of the tart pan and tap the bottom into an even layer. Bake for 10 minutes. Allow the tart shell to cool completely in the pan on the baking sheet on a wire rack. Leave the oven on. To make the cheesecake filling: Combine all of the cheesecake ingredients in a large bowl and beat with a hand mixer until fully combined and light and fluffy. This can also be done with a stand mixer using the paddle attachment. Assemble: Pour the cheesecake filling into the tart shell and using an offset spatula, smooth the top into an even layer. The filling should just reach the top of the tart shell. Chill for 3 hours before proceeding with assembly. 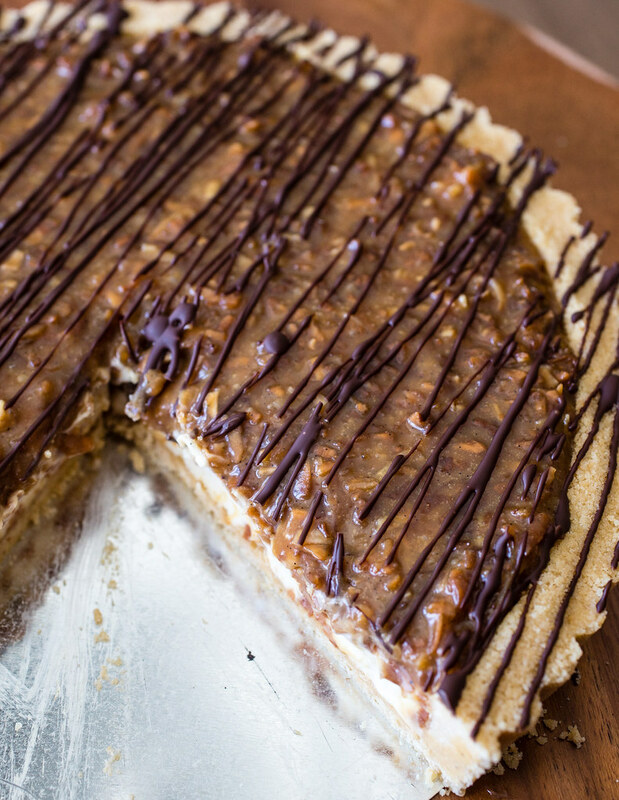 To make the caramel coconut topping: Spread the coconut out in an even layer on a large baking sheet. Bake for 8 minutes, until the coconut at the edges of the pan start to lightly brown. Toss the coconut and bake for another 2-4 minutes, or until the coconut is golden and evenly browned. Watch it carefully towards the end because it can burn easily (trust me). Allow the coconut to cool completely then add it to a medium bowl and stir in the remaining ¾ cup caramel sauce. Keep leftover caramel sauce in the fridge for things like ice cream, brownies, or coffee. Continue assembly: Once the cheesecake filling has set in the fridge, gently pour the caramel coconut topping on top and level it off in an even layer with an offset spatula. Drizzle the melted chocolate over the top of the tart. Chill for at least 4 hours before slicing and serving. Store leftovers tightly wrapped in the fridge for up to 3 days. First, I love the updated site! It looks great! Second, I LOVE this pie and cannot wait to try it! Thanks for your thoughts on the new site, Heather! I hope you love the pie/tart!! Hi Deborah! You can enter your name and email address in the area below the top photo on the Home page where it says Sign Up for Weekly Email Updates. The full recipe won’t be emailed but you’ll be emailed when I post new recipes on the site with links from the email right over to the recipe on the site. I hope that helps!